Strategy reviews are often approached with an innately serious tone and mood. And while reviews should be taken seriously and thoughtfully by your planning team, our own mid-year review reminded us it’s a good time to take your team off-site for a change of scenery. It is possible to spend time reconnecting as a team while balancing your strategy review with a bit of work and play. This week, we took our team to the beautiful shores of Lake Tahoe, Nevada, to host our own mid-year strategy review to look back on our performance and refocus our team for the second half of 2018. While we did host a very productive meeting with great strategic thinking, we also took some time to enjoy the sunshine as a team. 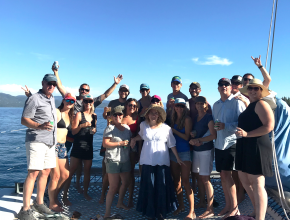 In fact, we spent the afternoon and evening enjoying the sand and sailing across Lake Tahoe on one of the region’s iconic catamarans. Strategy software built for sticky execution and professional performance reporting. Execute with confidence using purpose-built strategy software to manage, track, and report on your plan’s progress. Take advantage of what’s in your community. One of the things we all love about our organization is our location – specifically that we are only minutes from playing in the beauty of Lake Tahoe. We found an awesome location to host our meeting that was close to the beach for some relaxation time afterwards. Look around your community for off-site meeting spaces that your team can enjoy. Schedule a bit of work and a bit of play. We held a standard mid-year strategy review and kept ourselves on time. Then, we were able to enjoy each other after having some thoughtful conversations about our future. Work and play is a great approach to off-site meetings. Be strategic, but have fun. Strategy is hard work, but it doesn’t need to be overtly serious. Get your review finished, have the thoughtful review, and enjoy your team. Get the Complete Guide to Strategic Planning today.